Preventative eye care is critical for detecting problems early. 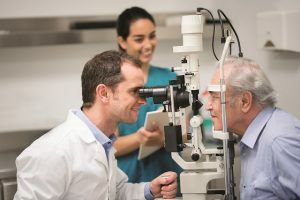 A look at some common age-related eye health problems and several healthy eye care tips that can help protect your vision as you age. Changes in vision can occur in your later years. As you reach the age of 60 and beyond, you can develop eye diseases and age-related eye health problems that could lead to vision loss. Sometimes these diseases present no symptoms and you may not even realize that you are experiencing changes in your vision until it’s too late. By getting regular eye exams and maintaining healthy habits for aging eyes, you have a better chance of not only detecting certain eye diseases early on but you’ll also help safeguard your vision as you age. Age-related macular degeneration (AMD), an eye disease that affects the macula – the center of the light-sensitive retina at the back of the eye which allows us to see fine detail and colors. AMD can cause central vision loss, so activities like reading, driving, watching TV and recognizing faces can all be affected. However, with macular degeneration, peripheral vision remains unaffected. Cataracts are cloudy areas in the typically clear lens of the eye. Depending on their size and location, they can affect normal vision. Most age-related cataracts develop gradually, so you may not notice changes in your vision in the early stages of this disease. Glaucoma is a group of eye diseases characterized by damage to the optic nerve. Individuals with a family history of glaucoma, African Americans and older adults have a greater risk of developing the disease. Glaucoma is often painless with no symptoms, but it can eventually result in vision loss. It is the leading cause of irreversible blindness. Diabetic retinopathy is a retinal disorder that occurs in people with diabetes. It is due to gradual damage to the tiny blood vessels that sustain the retina. These damaged blood vessels leak blood and other fluids that cause retinal tissue to swell and cloud vision. In some cases, this condition can cause blindness. Retinal detachment is a separation of the retina from the underlying tissue. It usually occurs unexpectedly due to changes in the fluid that fills the back of the eye. Other causes include trauma to the eye or head, health problems like advanced diabetes, and inflammatory eye disorders. If not treated right away, it can cause permanent loss of vision. Dry eye is a less severe but often chronic condition in which the eyes produce too few tears. Tears are vital because they help keep the front surface of the eye healthy and they provide clear vision. Dry eye is common in older adults. The following habits aren’t just for aging eyes. No matter how old you are, there are several lifestyle choices you can make to maintain healthy eyes. Shield eyes from UV rays. Always wear sunglasses with the best UV protection no matter what the season. A hat that shields your eyes from the sun can provide additional protection. Think nutrition. Your diet can affect your overall eye health. Good nutrition includes leafy greens, whole grains, nuts, fruits, vegetables…and lots of water. Also, remember to keep sugar intake in check. Don’t smoke. Smoking significantly increases your risk of developing disorders like cataracts and age-related macular degeneration. It also can increase your chance of developing optical nerve damage. Get enough sleep. One of the easiest ways to maintain eye health is by getting enough ZZZs. A healthy sleep routine not only contributes to general well-being, but it also helps keep your eyes from straining. Get regular eye exams. Preventative eye care is critical for detecting problems early. Adults over the age of 40 should get annual eye exams to help identify age-related eye diseases such as macular degeneration or glaucoma. It’s never too early to start protecting your eyes. Healthy eye care habits and regular exams can help maintain good eye health now and as you age. If you are a family caregiver and need assistance with your aging senior, such as getting them to and from their eye check-ups, FirstLight offers a number of Senior Care Services. I agree with you that eye health is very important for seniors to live high-quality senior years. Thanks for sharing these amazing suggestions as it will help seniors a lot in keeping their eyes healthy.